Learn with Play at Home: Tips for fun in the snow with kids. Tips for fun in the snow with kids. Last Friday we were treated to a day of awesome snow play at Lake Mountain Alpine Resort which is Melbourne's closest ski resort (just 90 mins from Melbourne). It is often referred to as the People's Mountain, as it's the place that many children experience snow for the first time. This was the second time we've been to Lake Mountain as a family and therefore the second time my kids have seen snow. As we rarely experience snow in Melbourne, it is a real thrill to be able to take the kids for tobogganing and general snow play like building snowmen and having snowball fights! This time we even all tried something new together as we had beginners skiing lesson. Yes, even 3 year-old Noah had a try too. Such a fun experience and highly recommended! Lake Mountain is Australia's premier location for cross-country skiing and is fabulous for beginners! I'll let the pictures do the talking from here and be sure to see our top 10 tips for having a great experience in the snow with kids at the bottom of the post. There were a few things that we learnt to do differently from our first snow trip and some tips we picked up on the day that overall made it a more pleasant experience. Having the right snow gear made a big difference to how long our kids lasted this time. If you don't own any you can borrow some from friends or hire the clothing both on and off the mountain. At the very least I'd recommend snow boots (dry feet are a must! ), waterproof gloves and waterproof pants. The friendly staff at Lake Mountain Alpine Resort were great at getting us all in the right sizes and making everyone feel comfortable and happy. It really seemed like they all loved their jobs which comes across when you're dealing with customers. If you've never skiied before, a beginners lesson is fabulous fun. Our instructor, Trevor, was great with kids and happy to lend a hand at any time. Maddie (6) turned out to be a bit of a natural. Must be a combination of her gymnastics experience and a no-fear attitude! Refuelling and taking a break from the snow regularly is a must with children if you're wanting the day to last. You can save money by bringing your own food and drinks. I love that Lake Mountain has extra activities like the tube run and flying fox. So much fun!! Snowman building is a must with kids but don't forget to bring some supplies to really jazz your snowman up. We brought some milk-bottle lids, carrots, pipe cleaners and river rocks in a zip-lock bag so that we'd have supplies on hand. Kids also always seem to be interested in snow-ball fights! Well, throwing snow-balls at the adults at the very least. You really need waterproof gloves for making snowmen and snowballs as woollen gloves will be soaked through very quickly leaving very cold and numb hands. A quick way to warm up hands and bodies is with a nice hot drink. Bring a filled thermos or two that you can pull out to quickly give anyone that extra warm energy boost that they need. The idea of hot chocolate always brings a smile to my kids' faces. 1. Layer clothing to keep children warm and insulated. If you're too warm, you can always remove a layer. 2. Hire or borrow proper snow boots/shoes, as dry feet is a must. Having some spare socks and pants is also a good idea to have in the car just in case. 3. Hire or borrow waterproof pants to go over your own layered pants. Asking friends if they have any ski gear you can borrow before you go can be a good way to save money. 4. You'll often find that you get the best value hiring a snow play package of shoes, pants and toboggan than getting each item separately. (I've seen packages as low as $15 to hire these for a whole day, off the mountain. You will find that the hiring prices are more expensive at the resort but you have the advantage of being properly fitted out in good quality gear and can go back easily if there are any issues). 5. Despite the freezing cold, you can get sunburnt from the light reflecting off the snow so remember to apply sunscreen. 6. Sun glasses or ski-goggles are great for keeping the glare and any snow out of your eyes. Things like snow goggles, gloves and beanies aren't usually hired out so you will need to bring your own with you. 7. Don't forget to bring along a little bag of snowman making supplies for the best snowmen. A snowman isn't a snowman without a carrot nose (according to my kids) and having a few other embellishments never goes astray. 8. Have a break every 30mins to 1 hour and get out of the snow and into the warmth to bring the kids' core body temperature back up. You'll find that having a warm drink and a snack will also help boost energy and help you get the most out of your day. Lake Mountain has delicious food available at standard prices but you can always save money by bringing your own food and drinks. 9. Avoid the queues by getting there early. If you can swing it, I'd definitely recommend trying to get a day off mid-week to visit, as the weekends during snow season are always busy. 10. Bring a thermos of hot chocolate that you can pull out as needed. It is a great way to get that extra boost of warmth and energy as required. With a bit of forethought and planning, you are bound to have a much better experience at the snow with your children. This visit we lasted for more than 6 hours and had a fantastic time thanks to following the above tips. 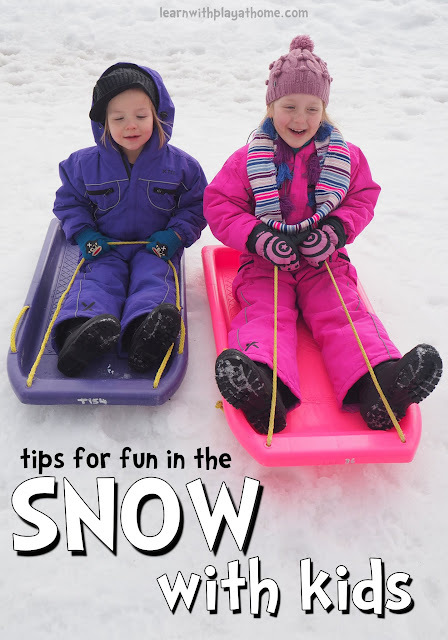 Do you have any more tips for having fun in the snow with kids?